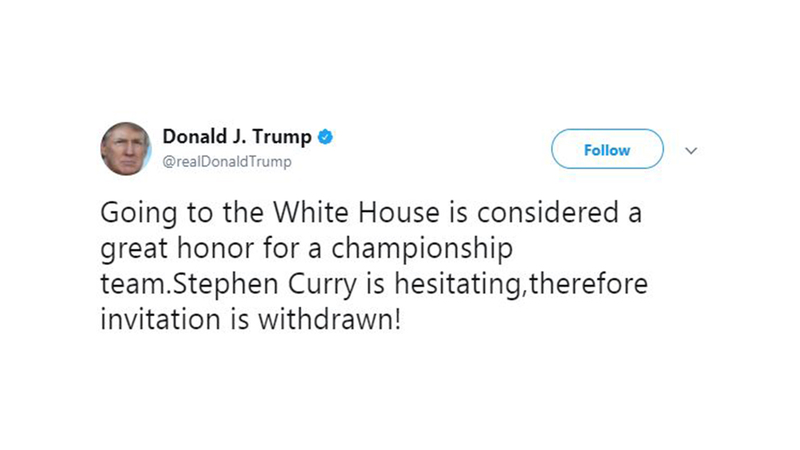 SAN FRANCISCO, California -- Trump kept up his foray into the sports world on Saturday, when he responded to comments by Stephen Curry of the Golden State Warriors, who has made it clear that he's not interested in a traditional White House trip for the NBA champions. It was not immediately clear whether Trump was rescinding the invitation for Curry or the entire team. Houston Rockets guard Chris Paul joined several professional athletes in denouncing President Donald Trump for suggesting that owners fire players who kneel during the national anthem and that fans consider walking out in protest "when somebody disrespects our flag." "With everything that's going on in our country, why are you focused on who's kneeling and visiting the White House??? #StayInYoLane," Paul tweeted. He also tweeted, "And I doubt he's man enough to call any of those players a son of a b**** to their face..."
Paul is currently the President of the NBA Players Association. Also, the National Football League and its players' union on Saturday released a statement against Trump's comments. "Divisive comments like these demonstrate an unfortunate lack of respect for the NFL, our great game and all of our players," the league commissioner, Roger Goodell, said in a statement. DeMaurice Smith, executive director of the NFL Players Association, tweeted: "We will never back down. We no longer can afford to stick to sports." Trump, during a political rally in Alabama on Friday night, also blamed a drop in NFL ratings on the nation's interest in "yours truly" as well as what he contended was a decline in violence in the game. Smith said the union won't shy away from "protecting the constitutional rights of our players as citizens as well as their safety as men who compete in a game that exposes them to great risks." Trump, who once owned the New Jersey Generals of the U.S. Football League, said those players are disrespecting the American flag and deserve to lose their jobs. "That's a total disrespect of our heritage. That's a total disrespect of everything that we stand for," Trump said, encouraging owners to act. Trump also predicted that any owner who followed the presidential encouragement would become "the most popular person in this country" - at least for a week. The players' union said in a statement that "no man or woman should ever have to choose a job that forces them to surrender their rights. No worker nor any athlete, professional or not, should be forced to become less than human when it comes to protecting their basic health and safety." The NFLPA said "the line that marks the balance between the rights of every citizen in our great country gets crossed when someone is told to just 'shut up and play.'" Buffalo Bills running back LeSean McCoy tweeted, "It's really sad man" and then used an obscenity to describe Trump. On the issue of violence on the field, Trump said players are being thrown out for aggressive tackles, and it's "not the same game." During his campaign, Trump often expressed nostalgia for the "old days" - claiming, for example, that protesters at his rallies would have been carried out on stretchers back then. He recently suggested police officers should be rougher with criminals and shouldn't protect their heads when pushing them into squad cars.